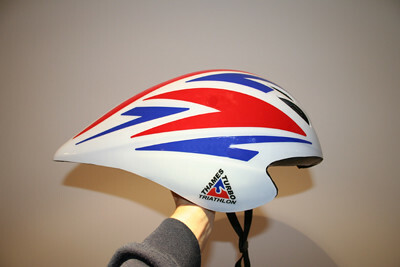 2007 Thames Turbo Aero Helmet, originally uploaded by rogerbarr99. What you can see is a Giro Advantage Helmet. It’s been modified (with consent from Giro) to have Thames Turbo club colours. It’s nice isn’t it!! It’s going to feel a million dollars riding along with this bin on. I have to say a huge thanks to Richard Gower (my friend and boss) for making it happen and for Ollie Christie for artworking the stickers.